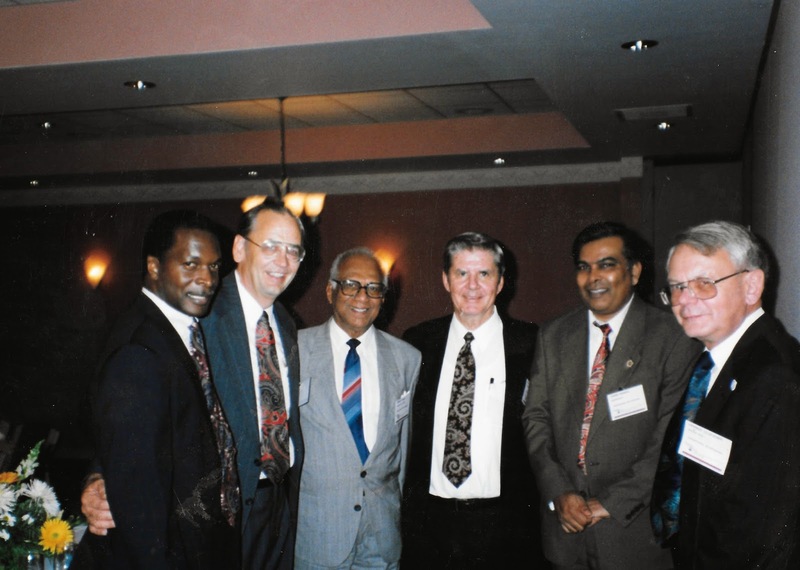 Dr. Cheddi Jagan, President of Guyana SA visited Virginia Tech in 1993 with the goal of obtaining consulting assistance for his country. I had already been making official visits to Universities in the former Soviet Union teaching computer automation and arranging exchange agreements. This earlier work provided invitation to be member of the group to meet with President Jagan. This was the first and only time the head of any country visited Virginia Tech (VT) making it an exciting experience. The US Secret Service is always in charge of security for heads of state -- this made for interesting dinner meeting with the agents running around looking a little crazy. 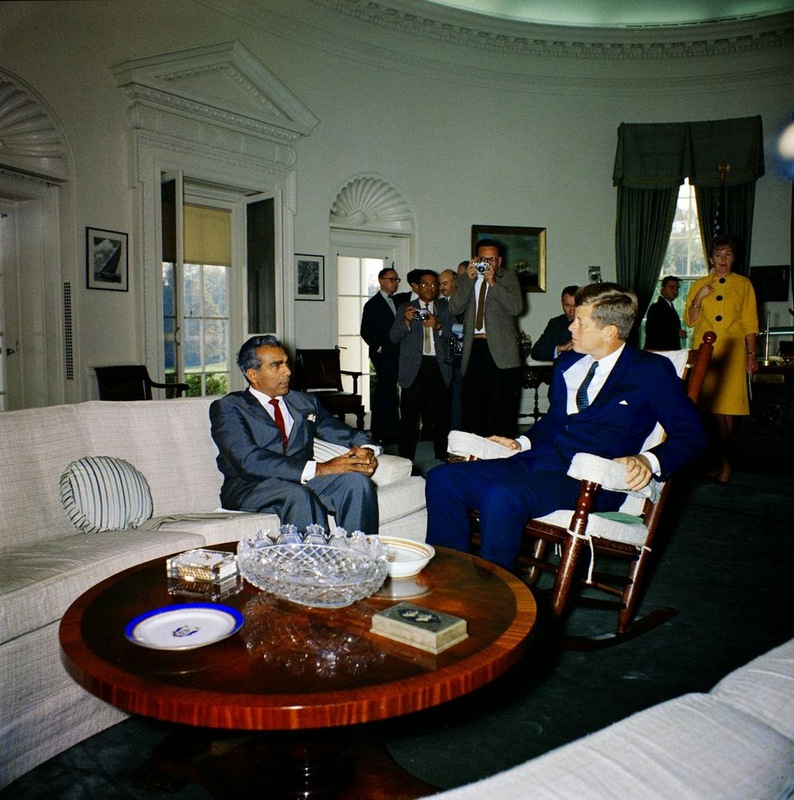 photo credit "John F. Kennedy Library"
When I had the opportunity to meet Dr. Jagan I told him I would be glad to visit Guyana and help with computer training however I also wanted to help the amateur radio operators with training for disaster communications. His response was a surprise and he replied "That would be just fine and I know an amateur operator near the capital --Raj 8R1RPN--. Always liking a new venture I quickly made plans for a visit and invited two of my friends in the college of Business to join my my wife Gaynell and I to check out the possibilities in Guyana. The visit turned out to be more then First Class - We were the guest of President Jagan and WOW - we were met at the Airport by the Presidents "Chief of Protocol" and taken to the presidents guest house as residents for the visit. Here we are at a Virginia Tech meeting L-R, VP International Development, David Larsen - (Me) VT faculty member, Dr. Cheddi Jagan - President of Guyana SA, James McCommas - Virginia Tech President, Guyana Ambassador to USA, Dean. 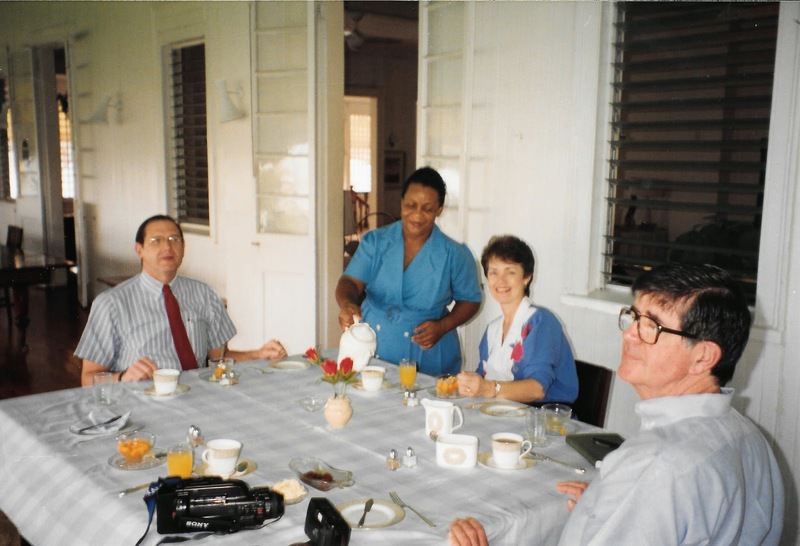 Having breakfast at the presidents guest house in Guyana. L-R Dr. Rodney Thompson, house staff, Gaynell Larsen KK4WWW, Dr. Jim Littlefield. Rodney & Jim are professor's in the College of Business at Virginia Tech. I had some VT grant funds for international travel and invited Jim & Rodney to join the team and provided part of their expenses. We did meet and work with amateur radio operators - here is Cleo Qushie 8R1CJ. Cleo was our host for all the radio operations during the first visit. Cleo and his wife are still good friends & retired in Florida. 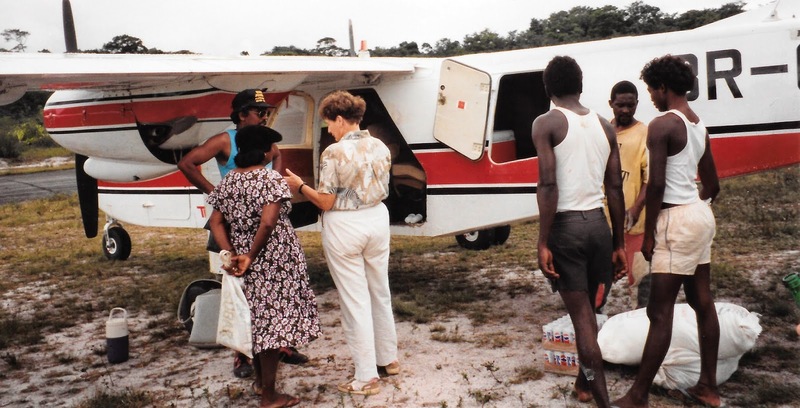 We had some time to expore Guyana & here we are chartering a small plane for visit to Kaieteur Falls. The falls is deep into the Rain Forest with a small dirt landing strip. I made this photo - the travel in small plane was thriller - I wondering what would happen if we went down in this jungle. 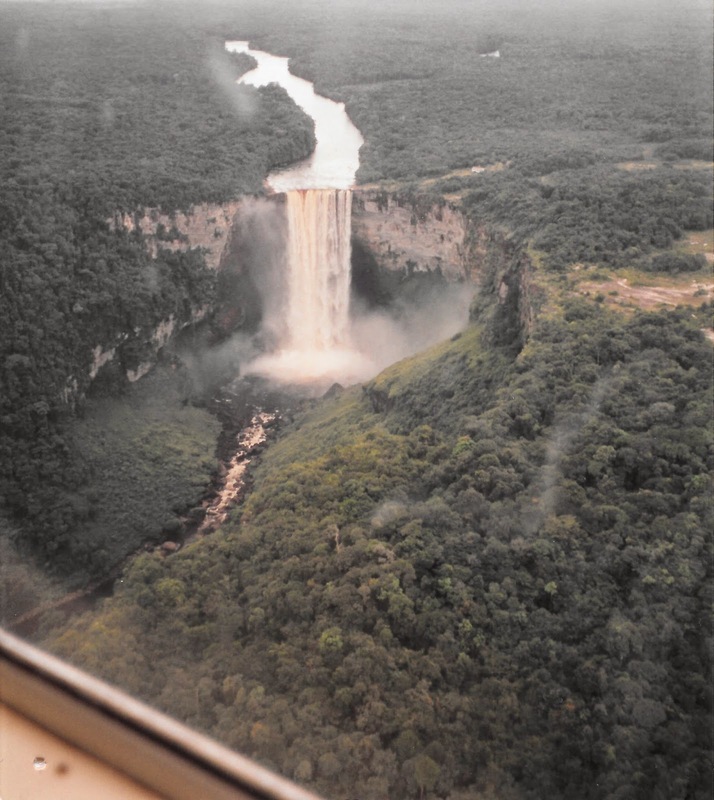 See Map and photos "CLICK"
Kaieteur Falls is a waterfall on the Potaro River in Kaieteur National Park, central Essequibo Territory, Guyana. It is 226 metres high when measured from its plunge over a sandstone and conglomerate cliff to the first break. Expand this photo and you can see the dirt landing strip to the right of the falls. It is natural at the falls with only natural infrastruture - no stairs or guard rails. 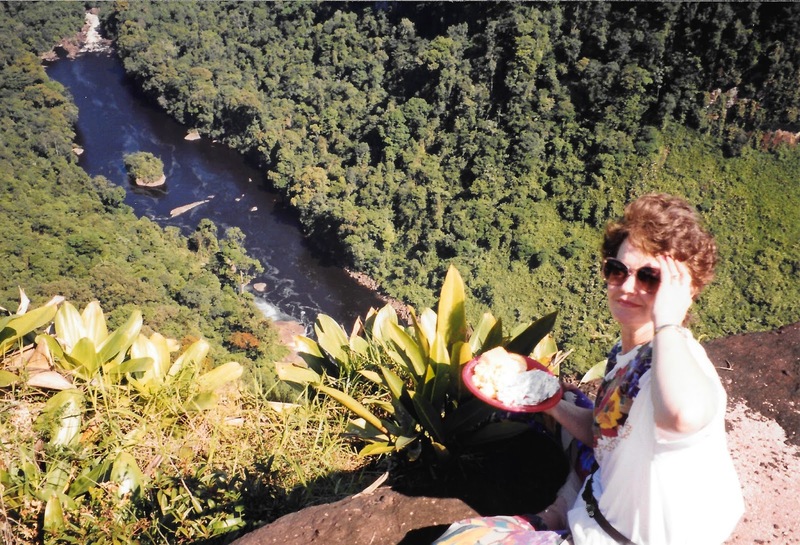 This is Gaynell looking over the edge --- IT IS 1000 feet down to the bottom. Gaynell made the comment - don't tell my dad about getting this close to the edge. Following up on our commitment to help with training for disaster communications we returned a few months later with team. Here is team leader Larry Vogt N4VA teaching a group about radio operation and how to obtain an amateur license. One member of the students was Peter Denny. 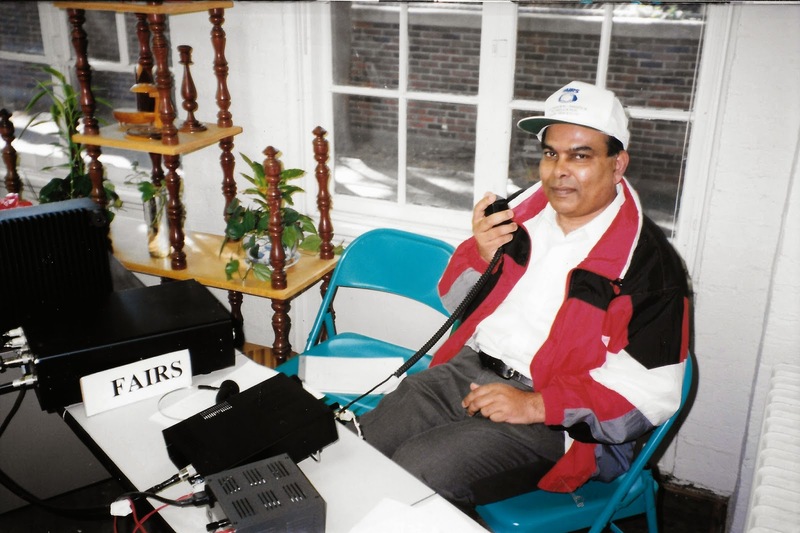 He had a dream sense childhood to become an amateur radio operator. Peter was licensed as 8R1WD and became a life long friend. 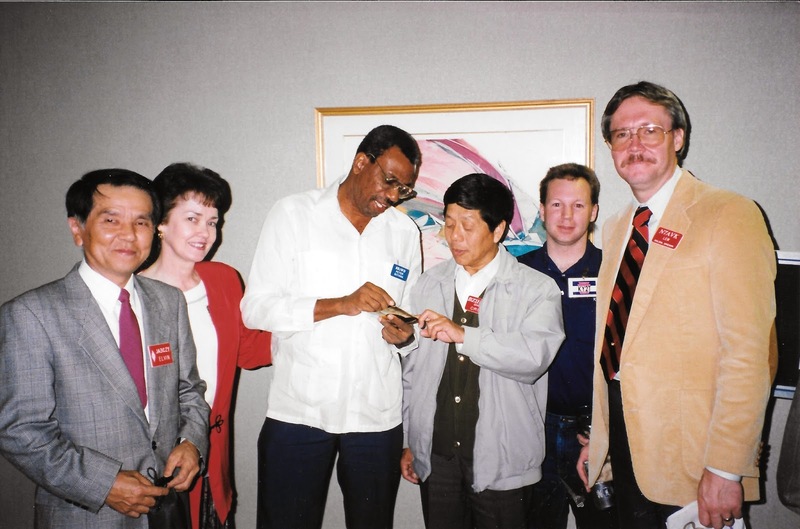 Third from left is Peter Denny 8R1WD and next to him is Mr. Chi Pin from China. It was at this meeting I ask Mr. Pin about a license to operate in China for our visit in a few months. Mr.Pin had our license ready when we reached Beijing that summer. See blog for China story. This meeting was at the Dayton Hamvention - a gathering of about 25,000 amateur radio operators in Dayton, Ohio. We have attended and represented our "Foundation for Amateur International Radio Service" (FAIRS) for more than 25 years. 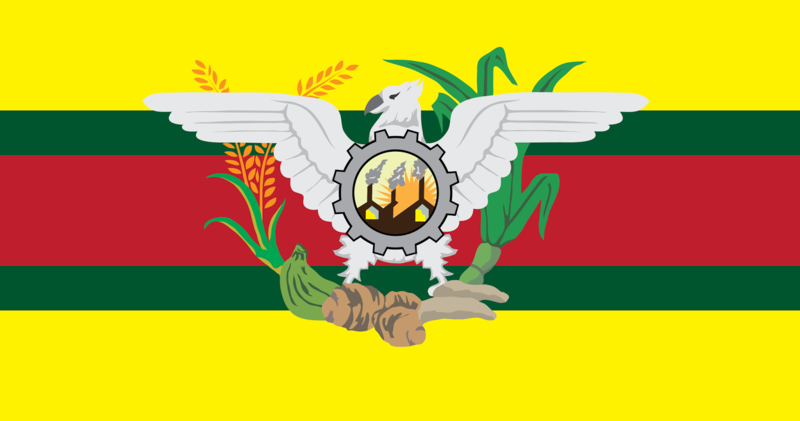 Follow up activities from the Guyana consulting visits. 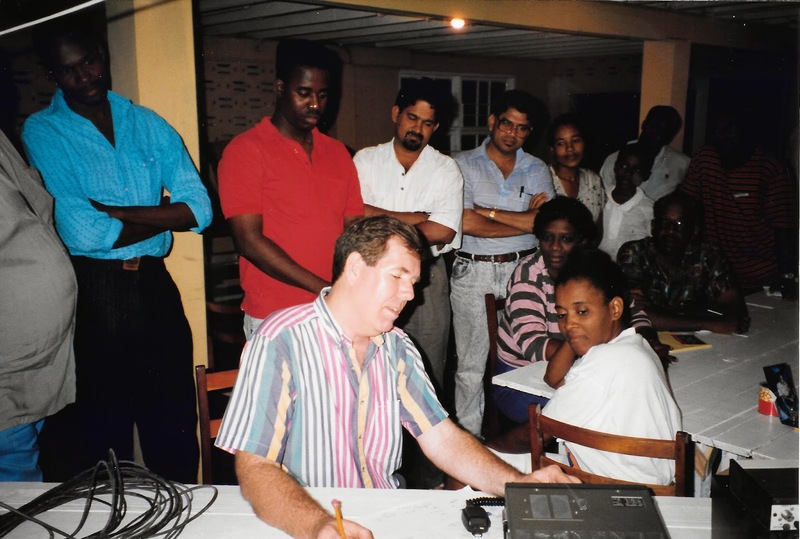 Peter Denny was a part of the Guyana Diplomatic Core for many years including Ambassador assignments in Moscow and Beijing. 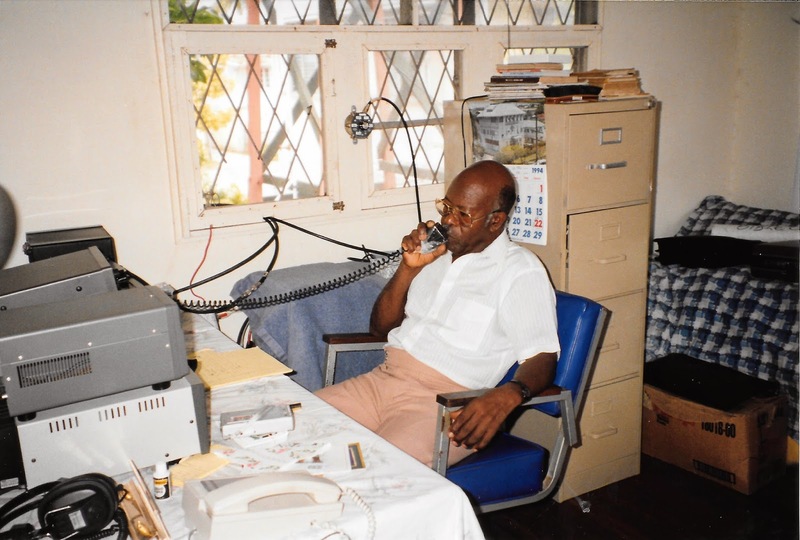 Peter arranged for a group of us amateur radio folks to operate from the Guyana Embassy in Washington D. C. Here is the Guyana Ambassador speaking on our radio. Many radio operators we talked to did not believe we were operating from the embassy. This was an honor and a lot of fun. Peter Denny 8R1WD has been a good friend for 20 years now and we have visited him in Guyana several times and he has been a guest at our house here in Floyd,VA. I talk to Peter 3 times a week on our ham radio schedule - 14,318.5 Mhz at 1200z Sunday,Tuesday and Thursday's. Helen Goncharsky UR5WA from Ukraine will be visiting us here at FAIRS headquarters for the month of May. Never a dull moment here in Floyd VA. Many life long friends from the dozens of FAIRS mission trips.